This year our country is celebrating the centennial of the National Park Service. I love our National Parks. Living in a suburb of Chicago, it does take a bit of effort to get to one. We don't exactly walk out our front door and face mile after mile of unspoiled nature. I think that makes us appreciate our trips to visit the parks even more. If you've been reading this blog for a bit of time, you may remember our big Yellowstone and Grand Teton family vacation 2 years ago. It was amazing, and I guess you could say it got us hooked. Last June, we took another family vacation out west to Oregon, Washington, and Canada. This time we included a few days in both Olympic National Park and Mt. Rainier National Park. We love staying in the national park lodges, seeing animals that we certainly don't get to see at home (slugs, grouse, marmot, bald eagles...), exploring and learning about different environments. There's no internet, no tvs, no cell service...just spending time together. At the Mt. Rainier lodge, Paradise Inn, we played a lot of evening Yahtzee by the fire while a gentleman played the piano and it snowed several inches (in June!) outside. 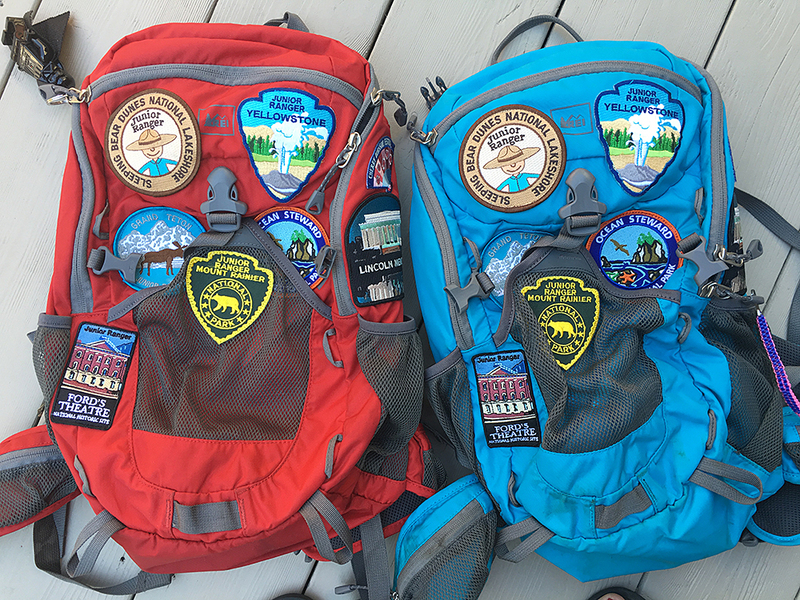 Our kids earn Junior Ranger badges that I stitch onto their backpacks after each trip. All of this is just to say, I really like National Parks. I mentioned a couple weeks ago that I signed up for the National Parks Birthday Club from The Frosted Pumpkin Stitchery. They released the first "clue", or piece of the pattern, on the National Parks Birthday last week. I couldn't wait to get started. I don't do a lot of cross stitch. Pretty much none! I am enjoying it so much. We've had a lot going on in our house over the last month and a half and I'm not going to lie - my anxiety levels have been through the roof. This has been a huge source of calming and relaxation for me. I stitch mostly in the evenings or while the kids are doing their homework. They have been very excited to watch the progress as well. I have one more section to stitch on the bottom and then I am done until the next piece of the pattern is released later this month. I will be sharing as I go!